Welcome to the first post in the notes on a frame series. I'll be sharing the stories behind how and why images were made - both commissioned and non-commissioned work. Enjoy! Feel free to post questions below in the comments.If there are any specific images of mine that you would like me to talk about, let me know and I'll add it to the queue. See all Notes On a Frame. This image was made during a wedding that I was shooting with a colleague of mine in Massachusetts. When I initially showed up at the bride's home to start documenting the ladies preparing themselves for the big day, I immediately noticed the flower girl squirming in her chair as she was getting er hair done and thought it would be an interesting sub-story to have a series of images of her throughout the day highlighting her progression. We see it all the time for the bride and groom and I thought it might be interesting to show a mini bride with a mini story. This moment of unguarded curiosity is one that I feel transcends the specific girl in the frame and speaks to something more universal - a child's wonder. Almost always I am looking to get across the who of a subject but this time it's about the what. Whenever I am documenting milestone events, I'm constantly looking for relationships and human behavior that sheds light on character. This specific trait is one that is present in all children this age as they start exploring their surroundings and learning how to process the world that they live in. From a storytelling standpoint, I like to think of this this image as seasoning. It's an adjective, not a noun. Does the full wedding story work without it? Absolutely. Is the story richer and more textured because of its inclusion? Absolutely. It adds a sense of humanity and gives the story context within the greater framework of human experience and emotion by showing us that at any given celebration there is always more going on beyond the couple getting married - life continues moving and doesn't stop for anyone or anything. Finding select times to hunt for that during the day makes the narrative more powerful and rooted. It was during the ceremony at church and I was off to the side of one of the pews - as close as the couple and priest requested that I be for the proceedings. During a full Catholic mass, there is a lot of down time where the pace of the day visually slows down so instead of taking the same picture over and over again of the couple listening to readings and the priest speaking, this is when I am typically trained on the guests looking for little sub-stories. Everyone stood for communion to begin and as the priest began speaking, the girl began yawning and I knew there was going to be an image there. 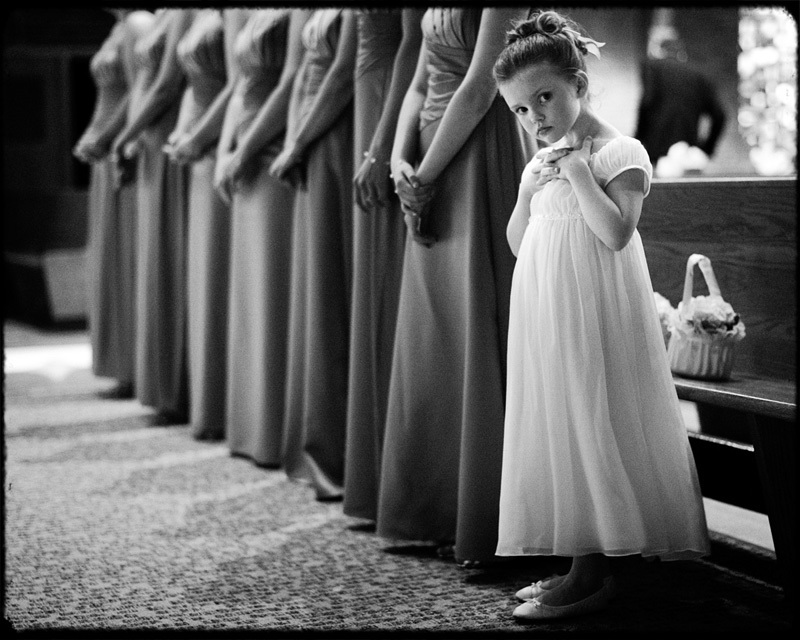 The leading lines of the rest of the women in the bridal party added a nice juxtaposition and by stepping forward a few paces I isolated the flower girl in the frame so that I could play to that sense of universality. The images was shot with my SLR and a 50mm. I shot three frames - one of her staring towards the alter bemused, one of her yawning, and one curiously inquiring what I was doing. This is one of the only non-portrait commissioned images I have ever made with a camera aware subject. I never flash inside of churches and I loved the flat and moody light so I chose to add in some grain by bumping up the ISO. This is a good frame. A great frame would be without her head intersecting the line created by the arm of the bridesmaid behind her and without the gentleman walking in the background... but that's what happened so that's what I shot. 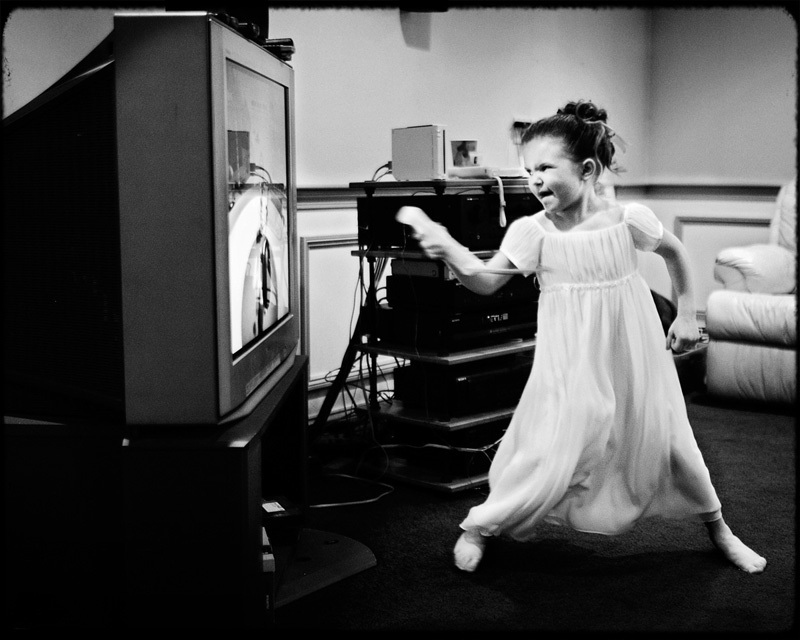 oh... and here's an image of her playing wii after she finished getting her hair done. Flower Power! Holy moly this is a great photo. The idea of tracking a sub-story in a wedding across the day is brilliant too. Thanks!